Will Ocarina of Time 3D Be the First Time You Use an In-Game Help System? It is an interesting question. Will the vision system in Ocarina of Time be the first time you’ve ever used an in-game help system? I know for me, and the answer is a big yes. It is slightly odd, but also makes sense. Time for a little story, then come on in to share your own. I just just can’t bring myself to use in-game help guides. In New Super Mario Bros. Wii, it was never an issue because the game wasn’t at all hard. 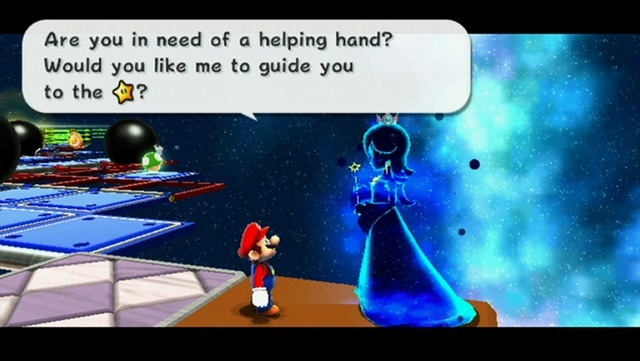 In Mario Galaxy 2, I saw the Cosmic Witch a couple of times, and I even spoke to her. I just couldn’t let her guide me to the star. Besides it feeling dirty and wrong, failing badly in the Mario Galaxy series was always fun, not frustrating. Even in repeat playthroughs, I’m yet to use a help system, even just to check them out. What’s odd about it is, and I’m willing to admit, that from time to time I’ll use the occasional online walkthrough when I get stuck in a game. Many people feel like that is what makes them feel dirty. For me, when I finally got an internet connection way back when, it was heaven – because heaven is full of how to finish all those games I was stuck in. In ways, the in-game guides are great because you can get help without going online. On the strange counterargument, I like the internet, but can’t bring myself to use in-game guides. I don’t even know the reason. Maybe it’s because they both feel like cheating, so I like taking the option where the game doesn’t know I cheated. Who really knows. Its odd. What I say without doubt, is that Ocarina of Time 3D’s vision system will be my first use of an in-game help system. Of course it’s not because I’ll need the help. It’s Ocarina of Time – I’ve played it many times before – and that is the reason. 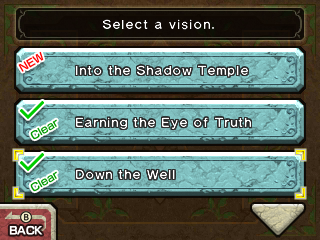 I won’t mind watching the vision help/hints/guides because I know how to do it. To me they’ll be cool little new clips that I can unlock throughout the game. I also feel that these visions are the best help system we’ve seen in a game to date, because they don’t do it for you – they just guide you on the right direction. Maybe it will help me get over my inability to use future in-game guides. What about you? Have you used a Super Guide or in-game hint system before? How do you feel about using the Ocarina of Time 3D hint system? On another note – will Master Quest also have the hints? Let us know your feelings in the comments below.